This revolutionary Equine drying rug can dry your horse or pony in record time - 30 minutes for full winter coats - due to an efficient wicking action, which absorbs more moisture faster than anything else tested. It also dries out more rapidly and fits in your washing machine at home so you can use it again and again with minimal maintenance. DriRug® is made using a super absorbent lightweight special Microfibre material, which has a rapid wicking action to absorb more moisture faster. It also dries out in record time so you can carry on doing what you love. DriRug® can be used after a shower, bathing or working up a sweat. It not only dries your horse faster but will also help regulate its temperature - cooling when he’s hot or warming when he’s cold. The special DriRug® material requires less maintenance and fuss – it can be machine washed at 60 degrees and tumble dried. Let it dry, shake it off and use it again and again. 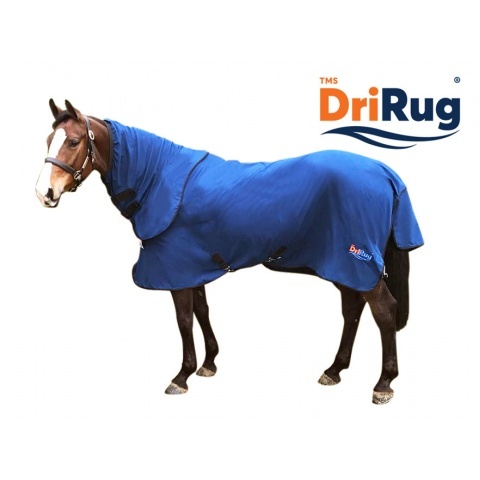 DriRug® offers 5 sizes for an excellent fit for horses between 4'9"’ to 7’3"
Includes double adjustable velcro front closure at chest, cross surcingles and a tail flap. Detachable elasticated Hoods are also available.